Our unbeatable package price on this stock boat makes this the ideal choice if you are looking for comfort and style at an affordable price. 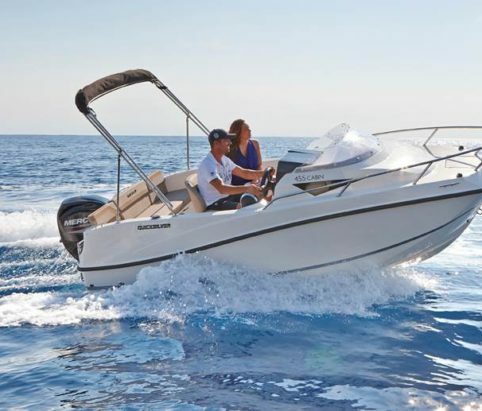 Just step aboard and you’ll immediately be reassured by the easy and safe transom access, the bow section and fore deck with its guardrail protection and the excellent anti-slip deck surfaces that guarantee safety for both children and adults. 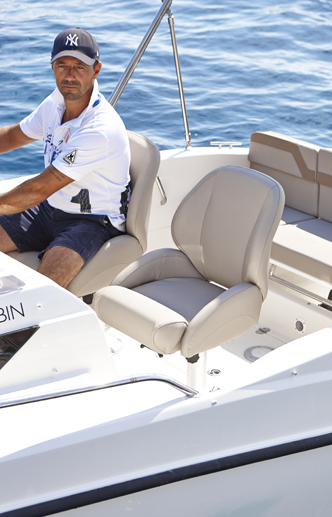 With its robust hull, the Activ 455 Cabin boasts a deep, well-protected cockpit with double bucket seats (co-pilot seat is optional) for improved safety and comfort, and a redesigned helm and dash that offers space for a GPS screen of up to 7”. 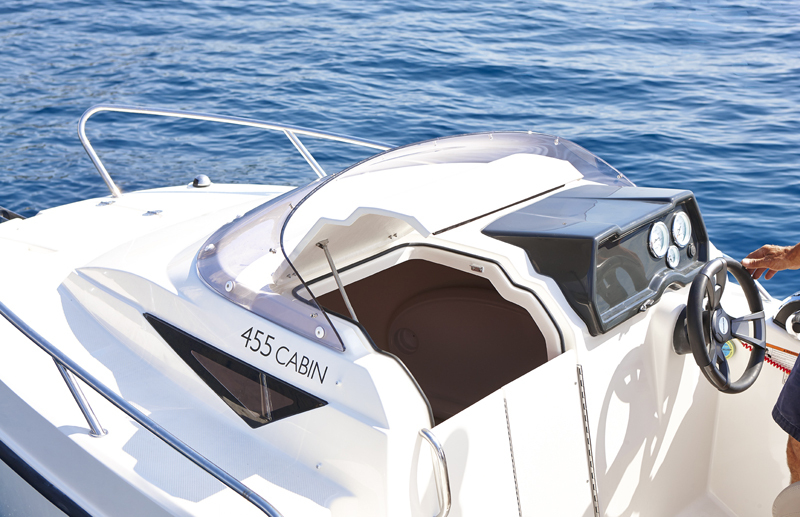 Despite its compact size, the Activ 455 Cabin’s new, stylish lines, and redesigned interior proportions give it an allure that puts it in a class ahead. In fact, almost the entire craft design has been re-thought, from the helm position and console, to the new, high-protection windscreen design, to the neat, easy-access transom boarding and the roomy, well-lit interior cabin with space for a toilet. With overnight accommodation facilities designed to cater for up to two adults, the Activ 455 Cabin offers a larger cabin that maximizes space and comfort with longer berths and space for a toilet that can be stowed away when not in use. The well protected cockpit offers seating for up to 4 people and can be converted into a dining area. The optional bimini awning tops the comfort list, providing welcome shade and protection. 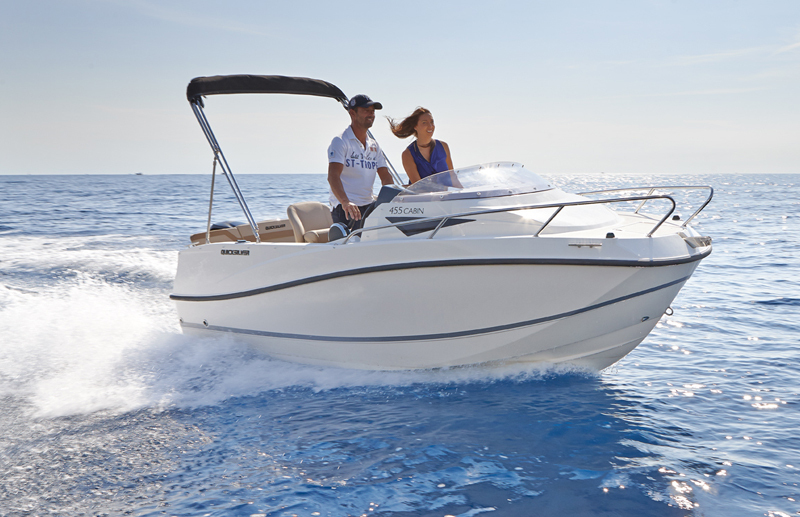 PACKAGED WITH A MARINER 20HP ELPT EFIT FOUR STROKE OUTBOARD – OTHER ENGINE OPTIONS ARE AVAILABLE!